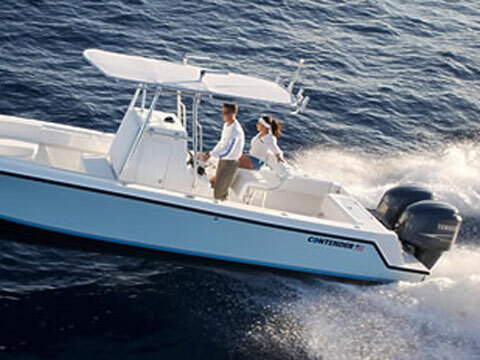 Gustos Boat Rentals services the Florida Keys and provides several top of the line boats at competitive rental prices. Contact us for all of your boat rental needs. Vacations are about having fun, relaxation, and doing things that you only dreamed of. Have you always dreamed of catching a sailfish or Blue Marlin? Maybe your dream is diving for lobster or diving some of the best reefs in the world. The Florida Keys offers all of these. So don't dream any more...go for it...go for the Gusto! What sets us apart from the competition is that we rent Contenders which are great tournament boats and sport fishing boats. These boats are not common at other boat rental companies. Additionally, if you are looking for a general purpose fishing boat, the Sailfish is second to none. Rent one of our clean, well-maintained powerboats for a day, 3 days or a week and enjoy the freedom of fishing, snorkeling, scuba diving or sightseeing at your own pace. We have a variety of quality boats â€“ Sailfish 2660cc, Contender 25 Open and Contender 27 open. Our Boat Rentals are kept in excellent condition and will allow you to get out where the fish are biting. Whether you take the boat to the blue waters of the Gulf Stream to catch Sailfish, Wahoo, Dolphin (Mahi), Kings, Tuna or Marlin or fish the tropical waters of the Florida Keys coast or Gulf of Mexico for Cobia, Grouper, Spanish Mackerel or Shark we have the fishing rental boat for you!